A warm welcome from Melissa at STRICTLY K9 DOG TRAINING offering Dog Training around Whitchurch, Oswestry & Ellesmere in North Shropshire - also serving North Wales and West Cheshire. Get in touch to experience a friendly, professional way to train your family pets using positive reward-based Obedience Dog Training methods from Puppy through to Adulthood within a class or individually. Home visits and workshops are also available. You can join training in a class or individually at any stage of your dog’s life or ability level. 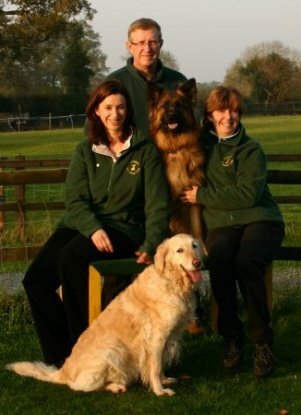 Strictly K9 Dog Training has KENNEL CLUB LISTED status incorporating the UK's largest dog training programme THE KENNEL CLUB'S GOOD CITIZEN DOG SCHEME Puppy Foundation, Bronze, Silver & Gold Awards; established for over 20 years. Book now for training classes daytime, evening or weekend. As an EXPERIENCED and approachable trainer, Melissa (featured below left with some of her family) is committed to helping you and your dog develop a rewarding relationship. A redesigned website will be launched in 2019.